Though there are different classes of community they are all referred by the common name Damanias.The Damania people are very much influenced by the culture of the neighboring state, Gujarat. The Damania's follow similar customs and traditions to that of the people of Gujarat. The common language spoken here is Gujarati. A major population of the Damania's is Hindus and a minority of Muslims and Christians. Atleast 45% of the total population of Daman and Diu have reached a high degree of urbanization.A specific community of the Gujarati people who came and settled here in Daman and Diu were given the name of Damania whose origin states that it is a village in the state of Gujarat. So most of the people who have their roots in Daman are given the last name Damania. Damania is used as a surname by two groups of people. It is very common among the Parsi community who are people from Iran long back settled in India. Apart from these Parsi people the real or the original residents of Daman used the name Damania as their surname. The people of Daman are skilled in ship building and they generally belong to the carpentry community who worship "Vishvakarma", the god of architecture. At much early point of time Daman and Diu being a part of the Portuguese colony is noted for its multi-faceted socio-cultural life which not only includes the people and their culture but also their festivals and fairs. There is no vast difference of the people of Daman and Diu from their neighboring counterparts in the state of Gujarat. Most of the Damanias' customs and traditions are same as that of Gujarat for even in the Union Parliament, the Rajya Sabha and the Lok Sabha, the Union territory of Daman and Diu is represented by the state of Gujarat. The socio-cultural life of the Damanias shows a blend of European, tribal and Indian culture and heritage. This blend of their culture is very much reflected in the traditional dances of Daman and Diu. The Damania's celebrate all the fairs and festivals with great joy and pomp and these occasions along with any religious program is not complete without music and dance for it is the most integral part of the socio-cultural life of Daman and Diu. Gujarati is the most commonly spoken language by the people of Daman and Diu. Hinduism is the main religion practiced by the people here. However there are also some Christians and Muslims in the region. Most of the customs and rituals followed by the Damanias are influenced and associated with the Hindu religion. Daman and Diu has shown a high rate of growth in the factor of urbanization. Most of the cultural talents of the Damanias are exhibited at the time of their fairs and festivals. Garba Festival and Folk Dance Festival are the two most common and major festivals of Daman and Diu. The Damania's are very much alike the people of Gujarat, the neighboring state who also follow similar customs and traditions. Hindus occupy the majority of the population of the Damanias and the most commonly spoken language here is Gujarati. The traditions and the customs followed at the time of birth, marriage, sacred thread and other ceremonies are very much similar to that observed by the people of Gujarat. Daman can boast of a rich and multi - faced cultural heritage. Both dance and music form an integral part of the customs and traditions of the people of Daman and Diu. 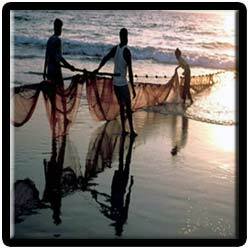 The fishing season here is marked by the celebration of the festival Nariyal Poornima. During this festival as a part of their customs and traditions the people gather in the sea-shore to offer coconut to the mighty Gods who preside over wind and water. The festival of Nariyal Poornima is also accompanied by a number of cultural feast and a vibrant water sports show. The Daman government as a part of their customs administration celebrates Christmas with lot of colourful lights, dance and music. Christmas is also celebrated in Daman to promote tourism. People from all over the country come here to celebrate the festival which is accompanied by fascinating Portuguese dance. The cookies of Daman prepared at the time of Christmas are very famous. The Hindu mythology considers Lord Shiva as the creator of the universe and the Hindu population of Daman Diu is not exceptional for this. The men of Daman and Diu generally wear a pyjama or a pant along with the normal shirts. Mostly they are seen with a cap on their heads whereas the tribal men wear a dhoti made of loin cloth which goes upto the knee and a cap. The traditional dress for the women folk is a dark blue saree with a kacha and a narrow cholo. The Christian people living in this area are mostly influenced by the European attires. Daman is very popularly known for its art of mat weaving which is also the traditional occupation of the people. The mats weaved here are adorned with lot of traditional and folk motifs following different patterns. Ivory carving and making of tortoise shell is one of the renowned works done by the people of Diu. The abundance of tortoise shell found on the sea shore is used to make several decorative and household items. Daman is very noted for its popular papyri food which is nothing but peas boiled with sweet and salt.Daman and Diu is also known for sea food. The people have a lot of affinity for the Parsee food. 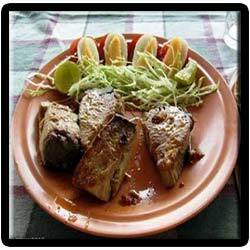 The native Gujarati food and Portuguese food are also very much liked by the people of Daman and Diu. Apart from the regular sea-food they eat, crab and lobsters also form a part of their delicacies. The breakfast of the Damanis is usually Rotli and tea. The lunch comprises of Rotla and saag and chokha along with saag and curry are taken for dinner. Special food like puri, lapsee, potaya, dudh-plag, dhakanu are prepared on special occasions and festivals. Alcohol is quite common among the people of Daman and Diu which includes beer, scotch whisky and feni.Tody, a native liquor is a favourite drink among the tribal people and all social and religious gatherings have this special drink. Some of the major occupation of the people of Daman and Diu are agriculture and fishing. Nearly 3727 hectares of land is under cultivation which includes crops like paddy, ragi, groundnut, pulses and beans, wheat, banana, sapota and mango. The people rear livestock like cattle, buffaloes, sheeps and goats. The people of Diu area mainly concentrated on weaving and dyeing. Processing and canning of fish is also an important occupation of the people. The dried salt, fish and coconuts are exported to other countries too.